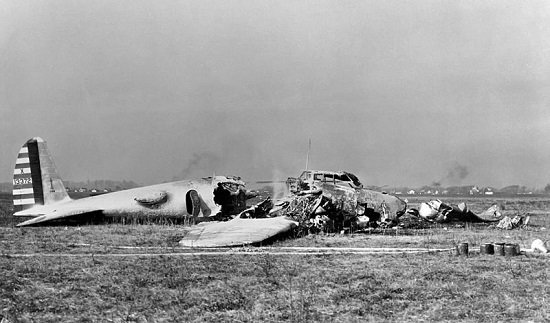 Crashed Boeing Model 299 at Wright Field, Ohio in 1934. 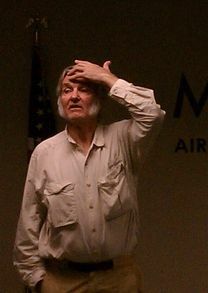 After he won the $10 million Ansari X Prize with SpaceShipOne in October 2004, Scaled Composites Founder Burt Rutan had two goals for the SpaceShipTwo suborbital tourism vehicle he was building for Richard Branson’s Virgin Galactic. He vowed the vehicle would be at least 100 times safer than any human spacecraft that had ever flow. And the Federal Aviation Administration (FAA) would certify the spaceship in a manner similar to way the agency certifies aircraft. These goals didn’t last very long. When industry-backed legislation emerged from Congress in December 2004, certification was nowhere to be found. The FAA would only be responsible for issuing experimental permits and launch licenses for the emerging industry. The agency was prohibited for eight years from issuing safety regulations for pilots and passengers except after an accident or close call. Its safety responsibilities were limited to protecting people and property not involved in flights. Passengers would fly under an informed consent regime by which they would acknowledge the risks they were taking before stepping aboard a vehicle. Various state legislatures have since codified the doctrine with liability laws that protect spacecraft operators, manufacturers and suppliers from lawsuits by passengers and their heirs except for cases of gross negligence or intentional harm. Rutan didn’t just abandon his goal of certification. He also began telling a different story about the safety of the ship he was building for Sir Richard. Rutan didn’t say so, but the “anyone” he was referring to was Branson’s Virgin Galactic, which publicly claimed that SpaceShipTwo would be at least 1,000 times safer than any spacecraft that had ever flown people to space. It was not until after the crash of SpaceShipTwo and the death of co-pilot Mike Alsbury that Branson came to embrace Rutan’s 1920’s safety formulation. The comparisons to this earlier era of human flight raise a number of questions. How exactly did the government handle regulation during those years? And how safe was aviation during that period? The first air mail flight between Washington, D.C. and New York City on May 18, 1918. Commercial space supporters tend to portray the early days of aviation as a period of unbridled experimentation by builders during which the government allowed the private sector to innovate by staying out of the way. Although this formulation is in line with the libertarian leanings of many in the industry, the truth is a bit more complicated. It was largely true for the first 15 years after the Wright Brothers first flew. However, by the time aviation began to take off in 1918, the U.S. government was deeply involved in regulating the industry. And the efforts had a very positive impact on safety. As it later did with space travel, the U.S. government began as an owner and operator by launching the Air Mail Service in 1918. The program expanded across the country over the next six years, with 24-year service between New York and San Francisco commencing in 1924. The service used government-owned planes, flown by government-employed pilots, and in a marked contrast to the norms of the day, placed a strong emphasis on safety. Elements of the safety program included strict criteria for selecting pilots and requiring regular medical exams for them, careful aircraft inspections, the use of a 180-item checklist at the end of virtually every trip, and regular engine and aircraft overhauls every 100 and 750 hours, respectively. The activity absorbed tremendous manpower: the ratio of mechanics to aircraft was nearly four to one, and 94 percent of airmail service employees were ground personnel. The safety benefits were obvious: the fatality rate for the Air Mail Service was one per 789,000 miles flown between 1922-1925, while the comparable figure for itinerant commercial fliers (for 1924 only) was one per 13,500. In contrast to the commercial space industry today, aviation industry executives actually sought federal safety oversight due to the success of the Air Mail Service. “It is interesting to note that this is the only industry that favors having itself regulated by government,” Commerce Secretary Herbert Hoover wrote in 1921. These calls were not enough to bring prompt legislative action. During the early 1920s, the aviation sector was too small to attract the level of congressional attention necessary to pass a bill. In 1925, however, Congress passed the Kelley Air Mail Act mandating the U.S. Post Office to turn responsibility for carrying airmail over to private contractors. This made federal air regulation a virtual necessity, and in 1926, Congress passed the original Air Commerce Act (ACA). The industry-backed measure was designed less to regulate than to promote private-sector aviation. In devising detailed rules to certify the airworthiness and safety of aircraft, regulators tried to avoid placing excessive burdens on the industry. The federal government would struggle with this dual mandate to regulate and promote the industry for decades to come. Western Air Express introduced the 32-passenger Fokker F-32 passenger plane in 1930. 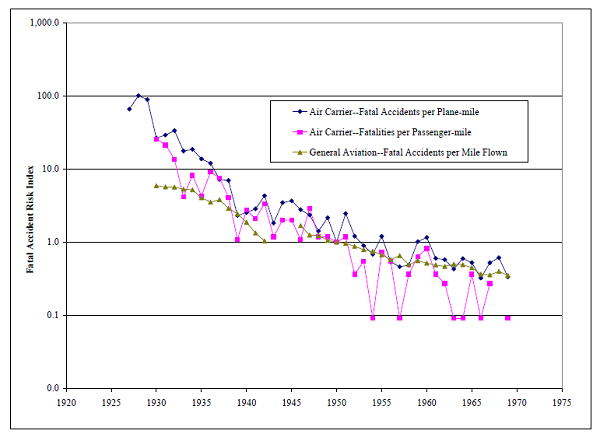 So, how safe was air travel during the 1920’s and 1930’s? The table below show fatal crashes and fatalities worldwide and in the United States for the years 1919 to 1939. The year 1919 was chosen because this is when a significant number accident began occurring. These figures were drawn from three different databases. The figures include civilian airline and private aviation crashes. Military accidents resulting from routine operations and combat were excluded, as were civilian aircraft shot down during war. Crashes of rigid airships are not used in the table. As the table shows, the number of accidents and fatalities were low for the years 1919 through 1926. There were 141 accidents during this period worldwide, averaging about 17.63 per year. A total of 351 people were killed in crashes during this period, including fatalities on the ground. That averages to just under 44 fatalities per year. Then, there were big increases in the number of crashes and fatalities beginning in 1927. That year saw 45 accidents and 108 deaths, more than doubling the totals from 1926. In 1929, there were 89 accidents claiming 222 lives worldwide, figures more than four times higher than three years earlier. The United States saw similar increases. In 1926, there were six accidents with seven casualties. Three years later, those figures rose to 29 crashes and 71 deaths. 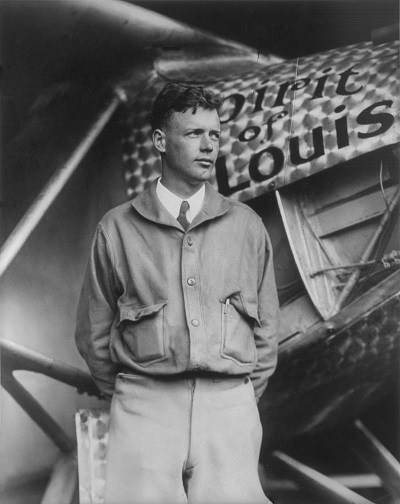 Charles Lindbergh. Lucky Lindy. Mr. New York to Paris. The air mail pilot turned international hero. The guy who had beaten the odds that had claimed the lives of six competitors. Winner of the $25,000 Orteig Prize that inspired Peter Diamandis to create the competition won by Rutan with SpaceShipOne 77 years later. Lindbergh’s flight gave an enormous boost to an aviation industry whose growth had long been hampered by a high accident rate and unreliability. 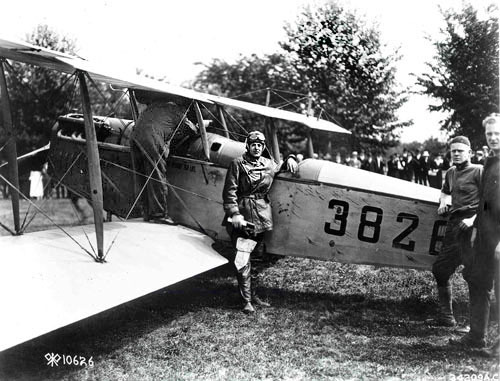 When the twenty-five-year-old former airmail pilot safely landed his plane, the Spirit of St. Louis, at Le Bourget Field near Paris, France, after a 33½-hour flight from Long Island, New York, on May 20–21, 1927, Americans gained a new confidence in air travel. Suddenly, everybody wanted to fly. In 1929 more than 170,000 paying passengers boarded United States airliners—nearly three times the 60,000 that had flown the previous year. Almost 3 million more—most of them business people—traveled in private planes in 1929. Even Mickey Mouse took to the air, mimicking Lindbergh’s flight in the 1928 Walt Disney cartoon Plane Crazy. Because of Lindbergh’s flight, aviation stocks soared. For a short time, even the stock of a small eastern company called Seaboard Airline saw activity—until it was discovered that the corporation was actually a railroad. As financial investors came forward, more and more fledgling airlines began to emerge. By the end of the 1920s, there were forty-four scheduled United States airlines, and many nonscheduled ones. The sudden increase in aviation caused problems for aviation companies as they struggled to keep up with demand. The result was not only more crashes and deaths, but a rise in accidents and casualties per mile flown. Statistically, 1928 and 1929 were the deadliest years in history for U.S. air carriers. Federal regulators also had a hard time keeping up with demand. Part of the problem was timing; the government had no sooner privatized the Air Mail Service and established the Aviation Board to regulate the industry as it was hit with a massive increase in demand for its oversight. The effectiveness of federal aviation oversight was further limited by a shortage of funding under the parsimonious President Calvin Coolidge, who urged cabinet officers not to waste paper clips. The Great Depression, which began in 1929, had a dual effect on aviation oversight. On the one hand, the reduced demand for aviation allowed the Aviation Board to get caught up on its backlog. The economic crisis also reduced the amount of funds the government could spend on safety activities. Despite these handicaps, the accident rate declined during 1930’s as both federal regulators and aviation companies gained experience. The U.S. suffered only five fatal crashes and 38 fatalities in 1939. Commercial air carriers saw dramatic improvements even as the number of miles flown increased, although the number of accidents continued to fluctuate as the government reorganized its safety oversight. Between March 26, 1939, the date of a fatal Braniff crash, and August 31, 1940, when 25 died in a Pennsylvania-Central crash, U.S. domestic airlines flew 1.4 billion passenger miles without a fatal accident. The fatality rate per passenger mile for 1939 as a whole was just a quarter of that in 1938, which, in turn, was about half that in 1936-37. Then, in the eight months after the reorganization, there were five fatal airline crashes, and the 1940 fatality nearly tripled that for 1939. Commercial aviation was able to grow and survive accidents because it served lucrative, existing markets for moving people and cargo from one place to another. It was able to grow along side other forms of transportation, which had their own safety issues, until it reached a tipping point where people were willing to take the risk of flying. The industry significantly improved its capabilities and its safety record beginning in the 1930’s under federal oversight. The suborbital space industry will not serve any point-to-point markets for the foreseeable future. The key markets for suborbital flights are space tourism, micro-gravity experiments, scientific research on the upper atmosphere, and the testing of new technologies in space. These factors will limit demand for the service and the number of vehicles that will be built. It’s also likely that passengers’ risk tolerance will be lower for space tourism today than it was for aviation in the 1920’s and 1930’s. This is a partly a result of the times we live in, where tolerance of risk is much lower than it was decades ago. However, the bigger issue is the nature of the voyage. Suborbital space tourism is essentially an extremely expensive joy ride to outer space that nobody actually needs to take. Statistically, driving an automobile is much more dangerous than flying on a commercial airliner today. But, we still drive because it’s an essential part of our day-to-day lives. We accepts the risk for that. Flying to space is not. Until the industry grows to the point where space travel is routine and occasional accidents are an accepted part of the transportation landscape, demand will be relatively low. For the industry, these factors raise several significant questions. Just how important is space tourism to a company’s overall survival? Can it continue survive by serving other markets? How robust will the market for space tourism be once there are a few fatal accidents? Will they be able to deal with long periods of not flying that could result after accidents? The answers will depend upon the specific operations of individual companies. One common problem they probably all face is the time and money required to build spacecraft and replace lost ones. Early aircraft were relatively easy to build; once demand rose sufficiently, they could be rolled off assembly lines relatively quickly. After SpaceShipTwo crashed, Virgin Galactic officials promised to complete the second vehicle — then supposedly about 65 percent complete — in five or six months. 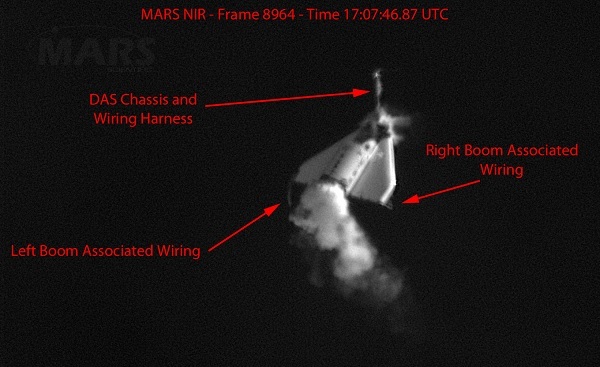 That deadline came and went; it was not until Feb. 19 — nearly 16 months after the crash — that Virgin rolled out the new spacecraft. And it is still months away from its first glide flight. Virgin Galactic initially plans to build five spacecraft and two WhiteKnightTwo mother ships. A single spacecraft crash would eliminate 20 percent of the fleet and could end up grounding the other vehicles until flaws are corrected. A crash of WhiteKnightTwo would eliminate half of the company’s capacity. If the history of aviation during the 1920’s and 1930’s holds one lesson for today’s commercial space industry, it is probably this: aim higher. Any operator that approximates the level of safety of that period is probably not going to last very long. It will end up with dead passengers, dead pilots and a business lacking sufficient customers to maintain its operations. Some industry supporters believe this will be a good thing on the long run. Unsafe operators will be driven out of business while safer ones will thrive. Market forces will give companies the incentive to operate safely, they say. Federal regulations at this point would merely increase the cost and complexity of new vehicles while doing little to improve safety. The federal regulator who oversees the industry doesn’t believe that relying on market forces for safety is enough. In 2014, FAA AST Associate Administrator George Nield called for the restrictions on his agency’s ability -to write regulations to expire as planned on Oct. 1, 2015. He argued that 50 years of human spaceflight provided plenty of valuable safety lessons for the new industry. Without some basic safety standards, irresponsible operators will enter the field and ruin commercial space’s reputation. Industry officials opposed the change, arguing that the so-called learning period should continue because no companies had yet flown tourists to space. Witt and others worked with supporters in Congress to expand the regulatory moratorium by eight years to Oct. 1, 2023. The industry feels it doesn’t want — or need — the government’s help on safety. Another comparison is the airline vs private aviation fallacy. While super-regulated Part 121 airlines are about as safe as they come (0 fatalities for years now), more-free private aviation is about 4x more deadly that driving per mile. Turns out having highly trained individuals in a highly structured and regulated environment is a recipe for VERY predictable results. The more i look into this, the more I’m convinced that the way oversight was set up in 2004 had more to do with Mojave’s libertarian beliefs than any careful study of the successes and failures of early aviation regulation or the specifics of human spaceflight. I agree. And don’t forget the lobbying of the Space Frontier Foundation over the years. We space cadets are an steange lot. We pride ourselves on knowing the lessons learned from complex systems and knowing how historical systems worked and compare to each other. The moment someone tries to codify those lessons learned, we fall back on our libertarian tendencies!